The SCARPA demo fleet just arrived and they look pretty sweet. 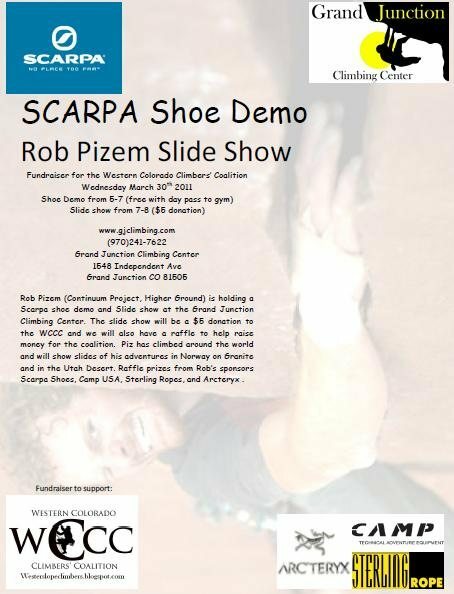 Don’t forget about the shoe demo at the Grand Junction Climbing Center and Rob Pizem slide show next Wednesday. Demo from 5-7, slide show with raffle from 7-8. Arcteryx stickers, SCARPA products, Sterling Rope discounts, and Wind Xtreme hats and gaiters! Come and see some great photos and hear about your favorite places in the desert! this looks little “jack nicholson-the shining”esque.